"Interview with an A Bomb"
"To guard the victory, to keep the peace... the mission of your AAF... Your Army Airforces from the airfronts beyond the battle fields, presents the continuing stories of the men in the AAF. 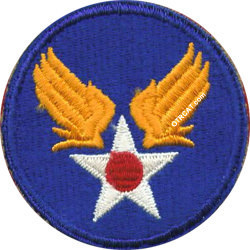 This program is an official military operation of the Army Airforces and is brought to you for contact with our airmen overseas... "
Broadcast in 1945, this old time radio show focused on the technological achievements of the Army Air Forces (AAF) including: dropping the Atomic bomb on Hiroshima, radar defenses, blind landings, hydroponics, the GI Bill, and much more. With dramatic reenactments and jazzy music interludes, this show featured interviews with the principal officers and pilots involved. Historically compelling and entertaining broadcast, Fighting AAF brings to life the important moments in Army Air Force history near the end of WWII. This collection is part of the AFRS recordings on Volume 5 of the WWII Collection. See also: Eyes Aloft, Wings to Victory and I Sustain the Wings. Be the first to comment on "Fighting AAF"